Germany's new radar satellite, TanDEM-X, has returned its first images. The spacecraft was launched from Kazakhstan on Monday on a mission to make the most precise 3D map of the Earth's surface. The pictures demonstrate the platform is in excellent health and ready to team up with the TerraSAR-X satellite launched in 2007. Together, the pair will trace the variation in height across the globe to a precision of better than two metres. This digital elevation model (DEM) will support a multitude of applications, such as the programming of navigation computers in military jets to enable them to fly ultra low. The data will also be given to relief workers to show them where an earthquake has wrought most damage in a city. Infoterra GmbH, the company with exclusive rights to commercialize the TanDEM information, says the market for radar products is steadily growing. 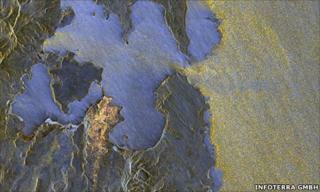 The new images depict a landscape in Ukraine, the north of Madagascar, and Moscow. The pictures illustrate neatly the particular specialism of using radar to sense the planet's surface. In the Madagascan data, for example, the choppiness of the waves in the open stretches of the Indian Ocean can be contrasted with the smooth reflection of the radar signal from the enclosed, calm waters of the Baie de Diego. And in the image of Moscow-Sheremetyevo airport, the flat concrete surfaces of the runways appear as black lines because the radar beam has been very efficiently reflected away from the satellite. TanDEM-X is flying in a polar orbit that is ever so slightly inclined to the one occupied by TerraSAR-X, some 514km above the planet. The intention is to make TanDEM-X fly an extremely tight helix around its more established sibling. This should be achieved by October. At times, the two satellites will be separated by as little as 200m. The pair's radars work by constantly bouncing microwave pulses off the ground and sea surface. By timing how long the signal takes to make the return trip, the instruments can determine differences in height. The compact orbital dance will give the pair "stereo vision", by enabling them to operate an interferometric mode in which one spacecraft acts as a transmitter/receiver and the other as a second receiver. Three-dimensional image acquisition is expected to start in earnest in January. The seamless DEM of the Earth's surface will be built up over three years of joint operations. Ultimately, it should have a vertical resolution of 1-2m and a spatial resolution of 12m - far superior to any previous global data set. The TerraSAR-X/TanDEM-X venture is operated on the basis of a public-private partnership. The Germany's space agency (DLR) owns the hardware; satellite manufacturer EADS Astrium has developed and built the technology; and Infoterra GmbH processes and sells the data.